In case you just woke up from a 30-year coma (bummer for you), here’s a quick primer on Strung Out: Way back in 1989, Jason Cruz got the bright idea to start a punk band with his guitar-playing buddies Rob Ramos and Jake Kiley. It wasn’t the kind of plan that required much more preparation than play fast, play loud, play all the time. No one thought this high school band would become a career. 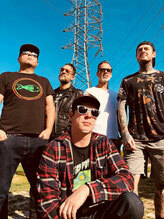 Yet here we are, nearly three decades later, and Strung Out is not only still active but thriving, a paragon of punk and an inspiration to thousands of fans (and musicians) worldwide. Cruz and his bandmates—Kiley, Ramos and bassist Chris Aiken—began working on Black Out The Sky in January 2017 with producer Kyle Black, who they had previously teamed up with on 2015’s blistering Transmission.Alpha.Delta, and who played a role in the band deciding to re-work two older songs, “Matchbook” and “UnKoil,” for the release. “Kyle is a fan of the band,” the singer says. “I am the kind of person who wants to stray and go out into the unknown when I’m in the studio, but Kyle represents our fans. He didn’t let me stray too far with the melody or the music—just far enough to keep it fresh." 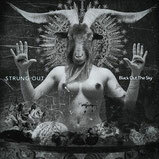 While in the studio, Strung Out realized some of the acoustic songs still needed drums. So the band enlisted their friend Sean Winchester, an accomplished drummer who has played with Everclear, Buckcherry and more, to fill out their sound. For their upcoming live shows, Strung Out will enlist RJ Shankle of California skate-punk band (and former tourmates) Runaway Kids to man the throne. Cruz is ecstatic about not only the fresh blood in his band, but what it means moving forward. On Black Out The Sky, Cruz continues to dig deep internally, exploring parts of himself he’s yet to fully understand, taking the listener along for the ride, no matter how bumpy it may get.